Do you have your bird's favorite treats? 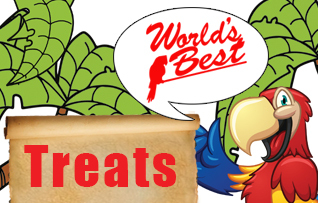 The World's Best Bird Treats are a number one seller and make happy birds. A healthy choice for birds, there's a World's Best Bird Treat flavor for every companion bird. Check out our selection to satisfy your birds needs. Please note: during the summer months, this item may melt during shipping. Please be mindful of this when ordering. Please note: during the summer months, this item may melt during shipping. Please be mindful of this when ordering. ? Contains: almonds, pecans, walnuts, peanuts, pistachios, macadamia nuts, and cashews.